Early morning transfer to Quito airport (approximately 45 minutes - 1 hour) for our flight to San Cristobal Island, Galapagos. The flight will take approximately 3.5 hrs including a stop in Guayaquil to pick up additional passengers (you will not need to disembark the plane) Departure time will be between 8.20am and 10.30am depending on flight schedule time. Welcome to San Cristobal, Galapagos Islands. The Galapagos National Institute has introduced a Transit Control Card. This card has a cost of US$20 and it must be purchased by every person travelling to the Galapagos Islands. You will need to purchase this card upon arrival to the domestic airport on day 2, prior to checking in to your Galapagos flight. Our flight will stop once in Guayaquil to pick up more passenger's (approx 3.5 hours total). Upon arrival we will need to go through immigration and pay the Galapagos National Park entrance fee of US$100 in cash (small bills please). We transfer from the airport to the hotel (approximately 15 minutes) Soon after, travel to La Loberia where you'll put on snorkelling gear for the first time and go for a swim with sea lions, and maybe even some sea turtles. Continue back to town. Tonight you may wish to head out with the group and enjoy some of the fresh seafood available. Today begins with a short boat ride to Leon Dormido (approx 45 mins) or Isla Lobos, observing along the way the abundant marine life that Galapagos is renowned for. On the way we might be able to spot nesting frigates and blue-footed boobies and/or might swim/snorkel with playful young sea lions. Here we can snorkel keeping an eye out below for sea turtles, manta rays and maybe the odd harmless Galapagos shark, to name a few. This snorkeling is in open sea, on occasion the currents can be quite strong so it's particularly important you are a confident swimmer for this activity. If you have any concerns, please ensure you speak with your leader. Included lunch today is a packed box lunch on board the boat! Unfortunately it is against National Park rules to eat on the beach. Later head we will head to the interpretation Center. Learn about the history of the 'Enchanted Islands' and the conservation projects which seek to preserve the unique Galapagos wildlife. Next, make our way to Frigatebird Hill (Cerro Tijeretas), which is located two kilometres from the Interpretation Center, southwest of Isla San Cristobal. It's quite a climb to the top, but well worth the amazing views of the bay. From here you can also see Kicker Rock, an eroded volcanic formation protruding from the sea which has become an emblem of the island. We'll return to town in the late afternoon/early evening. Start your second day on Isla Isabela with a short bus ride (approximately 15 minutes) to the Giant Tortoise Breeding Center where you'll observe giant tortoises in all stages of development. The centre has almost a thousand giant tortoises training for life on their own. After our visit we take a short bus ride (approximately 15 minutes) to a brackish lagoon where we will be able to observe flamingos. In the afternoon after an informative visit, board a small pangas for Tintoreras or Shark Alley. On our way we will go along the coast line in the hope to spot blue-footed boobies and the famous Galapagos penguin who is home on the western part of the arquipelago. On arrival, hop off for a short walk on this isolated islet and popular iguana nesting site that’s home to hundreds of marine iguanas. Snorkel in a calm inlet with colourful fish and winding underground lava tubes. This area is frequented by green sea turtles that like to rest on the calm, sandy bottom. Late afternoon, return to town in search of your own sandy resting spot and enjoy your first Isabela sunset, arguably the most beautiful of all the islands. Today begins nice an early at about 5 am. Take a boat transfer to Santa Cruz at approximately 6 am. Upon arrival transfer to Puerto Ayora to have breakfast. After breakfast head to the Charles Darwin Research Station. This is a great opportunity to learn more about conservation efforts to preserve the unique ecosystems of the Galapagos. You can even get close to giant tortoises which are being raised for the repopulation program. Next, head to a restaurant that offers a typical Eduadorian lunch package, simply referred to as ‘Menu’. Usually this consists of a fresh juice, basic entrée (usually a soup) as well as a main meal. These lunch deals are very popular throughout Ecuador so it’s a great way to eat like a local. In the afternoon visit the higher part of the islands to observe the giant tortoise roaming in its natural habitat. Afterwards visit a locally owned Sugar cane farm. Here the farmers will show us the process in which sugar cane is processed and turned into alcohol. Take the opportunity to try some! This morning we will hike approximately 3.5kms to Tortuga Bay beach where we will head out on a kayak excursion in a protected bay. Along the way, keep an eye out for eagle rays, sea turtles and blue-footed boobies. Later head back to Puerto Ayora. In the afternoon have free time to further explore the town. Tonight, enjoy an included group dinner. Today you will be transferred to Quito airport in time to catch your flight to Lima. The flight from Quito to Lima is not included in the price of the trip and you must purchase it separately. An arrival transfer will be waiting for you at Lima airport to take you to your hotel in Lima. As this is a combination trip, you will meet your new Tour Leader and fellow travellers at a welcome meeting at 2 pm . This meeting will be followed by an orientation walk of Miraflores. You'll say goodbye to the Lima Leader today. Take an included fight to Cusco. This flight will be unescorted, however you will be met at Cusco airport by your local leader. Spend a little time acclimatising to the high altitude (3,450 m) and then head out on an orientation walk with your tour leader. You’ll visit the facade of Qoricancha temple, the local San Pedro market, the main square, past the 12 Angled Stone, Regocijo Square and San Blas Square. Finally you’ll visit the Chocolate museum where there will be an opportunity to sample a hot chocolate made from local cacao beans. This might be a good opportunity to purchase some gifts or souvenirs. There’s a small store where you’ll find various handicrafts and a variety of artisanal chocolate products. You might feel overwhelmed by all there is to see in Cusco, but there will be more time for you to go exploring at the end of the trip. Notes: As this is a combination trip, your experience can be quite different to the other travellers. Some will have started earlier in Lima and everyone will choose their own route to Machu Picchu, either by train or trekking. Due to the high altitude of many of places we visit, the air is thinner and some people can suffer altitude sickness, regardless of age, gender or fitness. Please see the 'Is This Trip Right For You?' and 'Health' sections in the trip notes for detailed information. Depending on the travel arrangements you made before the trip, during the next four days you’ll be doing one of the following: hiking the Classic Inca Trail, hiking the Inca Quarry Trail or staying in Cusco for another two days before taking the train to Aguas Calientes. While away from Cusco, the bulk of your luggage will be stored at your hotel. If you’re hiking the Inca Trail or the Inca Quarry Trail, the evening before you leave Cusco you'll receive a small duffle bag to carry your clothes in for the next four days (5 kg maximum). Your team of porters will carry these bags for you, together with the food and equipment for the trail. Please note that you won't have access to these items until the end of each day, as the porters will always be ahead of the group. If you’re travelling to Aguas Calientes by train, you'll be able to leave most of your luggage at the hotel in Cusco and only travel with the necessary items during the excursion by train. Route 1 Classic Inca Trail: Today travel by minivan to the 82 kilometre marker and meet your crew of local porters, cook and guide. The first day includes uphill trekking to the campsite, which is at 3,100 metres above sea level. On the way you’ll see the Inca sites of Ollantaytambo, Huillca Raccay and Llactapata, as well as incredible views of snow-capped Veronica Peak. In the evening, unwind at the campsite with a nourishing meal. 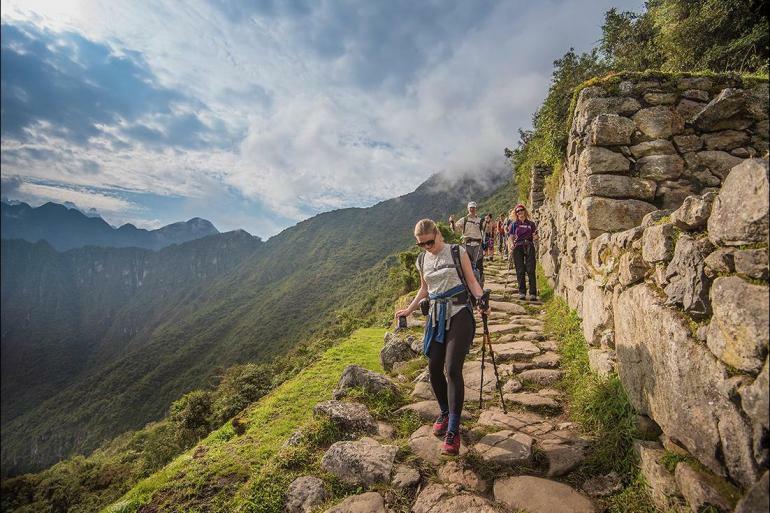 Notes: The Inca Trail is within the abilities of most reasonably fit people, but please come prepared, as the trail is 45 kilometres long and often steep. Each day's journey generally consists of seven hours of walking (uphill and downhill), with stops for snacks and lunch. Trekking usually begins at 7 am (except on the fourth morning) and you reach the campsite around 5 pm. Accommodation on the trek is camping (three nights). Double tents (twin-share) and foam camping mats will be provided. The porters will set up the tents while the cook prepares meals. Route 2 Inca Quarry Trail: Make an early start today and drive to Choquequilla, a small ceremonial place where Incas worshipped the moon. Drive to the starting point of the trek, Rafq'a, and meet the horsemen who join us on the hike. After an hour’s walk, reach the small community of Socma. Carry on to the Perolniyoc cascade lookout, an opportunity to stop for photos and a food break. Continue to the campsite, which is 3,700 meters above sea level. You should reach the campsite around lunchtime. After lunch, set off to explore the Q'orimarca archaeological site, which once served as a checkpoint to the Incas. Notes: The Inca Quarry Trail is within the abilities of most reasonably fit people. The hike is 26 kilometres long in total and its highest pass is at 4,450 meters above sea level. Throughout the trek, horses will carry your gear and camping equipment. The first two nights are spent camping and the third night you will stay at a simple hotel. Double tents (twin-share) and foam camping mats will be provided. The porters will set up the tents while the cook prepares meals. Route 3 Train: After spending the night in the Ollantaytambo, leave around 9.30 am and take a short drive to the town of Pisac. Pisac is well known for its market. Here you’ll have the opportunity to shop for souvenirs and perhaps try some local Empanadas. Arrive back into Cusco in the afternoon, where your leader will take you to San Pedro Market in order to buy some things for a picnic tomorrow. Notes: Included lunch and dinner on this day is for people trekking the Inca or Inca Quarry Trail only. Route 1 Classic Inca Trail: This is the most challenging day of the trek as you ascend a long steep path (approximately five hours) to reach the highest point of the trail. Colloquially known as 'Dead Woman's Pass', Warmiwanusca sits at a height of 4,200 meters above sea level, providing amazing views of the valley below. The group will then descend to the campsite in the Pacaymayo Valley at 3,650 metres. Route 2 Inca Quarry Trail: This is the most challenging and rewarding day of the hike. A three-hour walk takes us to the top of the first pass of Puccaqasa (approximately 4,370 meters high). After enjoying picturesque views of the valley, it’s a short walk before stopping for lunch. Afterwards, make the two-hour hike to Kuychicassa, the highest pass of the trek at 4,450 meters. From here, descend to the sacred site the Incas called Intipunku (Sun Gate), with views of the Nevado Veronica mountain. Head to the campsite, only a stone’s throw away at Choquetacarpo. Route 3 Train: Today, take a taxi to Tambomachay, an archaeological site just outside of Cusco. From here you’ll take a short downhill walk (between one and three hours) back to Cusco. On the way, stop to admire some of the archaeological sites, including Puka Pukara, Qinqu Quenqo and Saksaywaman. Arrive back in Cusco in the afternoon and enjoy some free time to go shopping, or perhaps visit Merida, Mendivil and Olave art galleries and workshops. Your tour leader will be able to give you some suggestions or point you in the right direction. Notes: Included lunch and dinner on this day is for people trekking the Inca or Quarry Trail only. Route 1 Classic Inca Trail: Start the day with a climb through the Pacaymayo Valley to Runkuracay pass (3,980 metres). Enjoy views of the snow-capped mountain of Cordillera Vilcabamba before descending for around two to three hours to the ruins of Sayacmarca. Continue over the trail’s third pass to the ruins of Phuyupatamarca (3,850 metres), also known as 'Town Above the Clouds'. Start the two-hour descent down the Inca steps to the final night's campsite by the Winay Wayna archaeological site. Route 2 Inca Quarry Trail: Today’s hike will all be downhill. The first stop is the incomplete Kachiqata quarry, where the Incas were intercepted by the Spanish. Around midday, come to the end of the trek. Explore the cobbled streets of Ollantaytambo before taking the short train journey to Aguas Calientes. This is where you’ll meet up with the travellers in your group who didn't hike. Visiting the natural hot springs in town is a soothing way to spend the late afternoon. Spend the night in a comfortable hotel before tomorrow’s visit to Machu Picchu. Route 3 Train: After a drive to Ollantaytambo (about one and a half hours), catch a train through the winding Urubamba Valley to Aguas Calientes (another one and a half hours). The city is nestled in the cloud forest at the foot of Machu Picchu. For those who want a sneak peak, there is time to visit Machu Picchu independently before a guided tour the following day. Otherwise, you can while away the afternoon in the natural hot springs at Aguas Calientes. Notes: Included lunch and dinner on this day is for people trekking the Inca or Quarry Trail only. Route 1 Inca Trail: This is the final and most spectacular leg of the trek to Machu Picchu. The day starts before dawn with breakfast at 4am. Say farewell to the porters as they descend to the train station and then begin hiking by 430am. One the final checkpoint opens at 5am, begin the final leg of the trek. The walk to Intipunku (the Sun Gate) takes around two-and-a-half hours. Weather permitting, enjoy unforgettable views over the ‘Lost City of the Incas’ as you enter Machu Picchu through the Sungate Route 2 Inca Quarry Trail: Depending on weather conditions, take a bus at 5:30 am this morning along the winding road to Machu Picchu. The journey takes around 30 minutes. 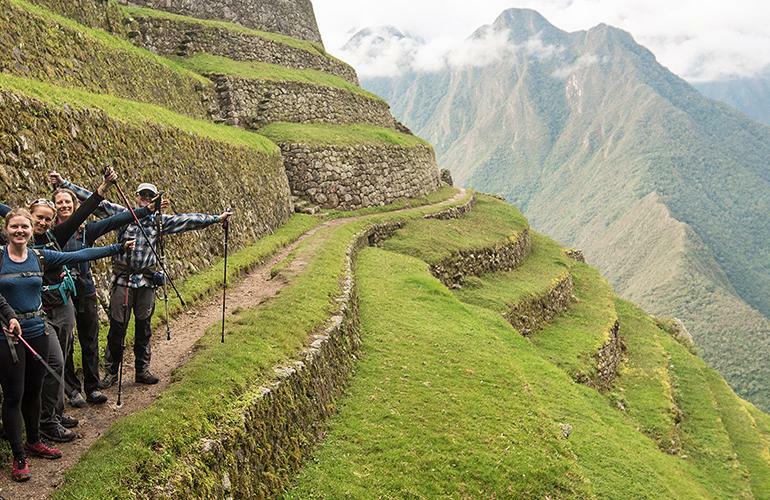 At Machu Picchu, join up with the travellers in your group who hiked the Classic Inca Trail. If skies are clear, enjoy a spectacular views over the ancient city from the Sun Gate, before going on a guided walk around the ruins. Route 3 Train: Take an early bus up to Machu Picchu at 5.30 am. The city was built around 1440 AD as a country retreat for Incan nobility, but there’s evidence that the land had been a sacred Incan site for much longer. Take a guided tour around the ruins of temples, palaces and living quarters, and enjoy free time afterwards to wander around on your own before the group returns to Cusco. Visiting Machu Picchu: According to Machu Picchu visiting regulations, all visitors must follow a pre-determined route within the site. This route must be followed in one direction only and once the guided visit commences exiting and re-entering the site is not permitted. Once the guided visit concludes, visitors must exit the site and personal exploration of Machu Picchu is not permitted. For all trails - after taking advantage of the seemingly endless photo opportunities, it's time to return to Cusco for a well-deserved shower and a pisco sour. Your evening is then free for the last night of your adventure. Notes: Due to Intrepid's internal safety policy, our leaders are specifically prohibited from recommending or assisting with booking trips to the mountaintop ruins of Wayna Picchu. Your tour comes to an end today and there are no activities planned. As there was little time spent in Cusco at the start of the trip, you may like to stay on for a few extra days to make the most of your visit here. We’ll be happy to assist in booking accommodation (subject to availability). If you decide to stay on, visit some of the sites you didn’t cover during your orientation tour at the beginning of the trip. These may include the Inca ruins of Coricancha, Saqsaywaman, Q'enqo, Pica Pakara, Pisac and Ollantaytambo. Notes: You may want to consider purchasing a Boleto Turistico (tourism ticket) It gains access to the many fascinating museums here such as the Contemporary Art Museum, Regional History Museum and Qosqo Native Art Museum (transport & guides not included). Please speak with your tour leader about this for more details.